Homemade soups are my winter lunch favorites. 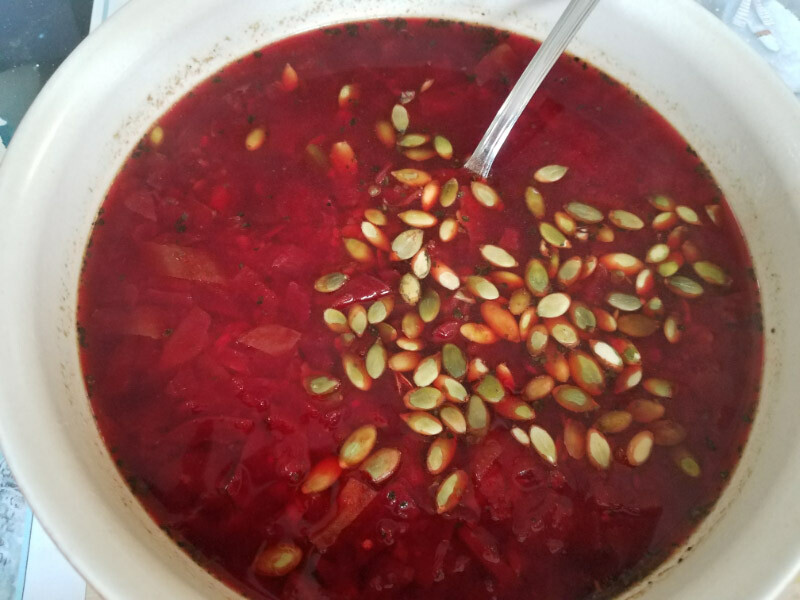 I like Root Soup: easy to make with fresh beet, potato, and carrot…seasoned with onion, garlic and basil. I let it cook long enough for the vegetables to become soft enough to mash a little. The pumpkin seeds on top provide just enough crunch (and protein too). I’ve already had a cold (and ear infection) this year and Homemade Chicken Noodle soup tasted so good. I made it several different ways. This one started with chicken bouillon with orange peel, dried onions and garlic, soba noodles and canned chicken. The soba noodles only take about 5 minutes to cook. While the soup bubbled on the stove, I use the scissors to cut up some arugula into the bowl. At the end of the 5 minutes, I poured the hot liquid over the greens – gave a stir. The arugula was part of the soup but not overcooked! So good… and just what I needed to get better.